Earlier this week, Roku named Matthew Anderson as its first chief marketing officer. 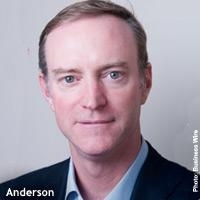 Having already served as a strategic advisor to the digital set-top box maker, the transition should be easy for Anderson. Yet, he faces a huge marketing challenge as a long list of competitors -- from Microsoft and Google to Apple, Sony, and Samsung (which just bought Boxee) -- continue to turn up the heat on Roku. Less than two days into the job, the former News Corp. international exec talked with Online Media Daily about Roku’s digital marketing strategy, and why he’s so confident the company will succeed. OMD: What’s the most important thing to know about the digital set-top-box space, today? Anderson: It’s growing very fast. … Across the whole media industry, all the big trends point to the consumption of streaming [content]. OMD: What’s a top priority for you, today? Anderson: Q4 has historically been a big time for [Roku and other set-top-box] players … We tend to concentrate a big spend … Digital has historically been a big part of that. OMD: How else does digital fit into Roku’s marketing strategy? Anderson: Digital is good for directly selling products, and we use it to promote the content we have. Roku is now crossed with more than 1,000 channels, but [non-subscribers] are asking, ‘What can I stream?’ So, we’re putting a lot of focus on what [content] people can get with Roku. OMD: What forms will your digital marketing efforts take in the fourth quarter? Anderson: We’ve got interesting things planned for video and mobile… but I’d rather just call it all digital at this point. OMD: How will Roku’s digital marketing strategy change over the next year? Anderson: We’re going to increasingly focus on specialization by genres like news … areas where we have content leadership … [It’s] what we see as one of our big competitive advantages. OMD: How else does Roku plan on beating the competition? Anderson: The good news is [our competitors] all have big challenges, and we have really great products, and a broader range of products. … Strong partnerships -- with retail partners and content partners -- are also important. 1 comment about "Roku's Anderson Touts Company's Strategy, Products". Bobby Campbell from Adkarma, August 29, 2013 at 10:54 a.m. If I was part of traditional linear content provider I would be looking to buy someone like roku asap if possible. Streaming content and its consumption is going parabolic, and that is opeing all kinds of new advertising opportunities for our clients.